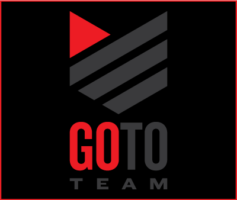 Go To Team Elite Camera Crew & Video Production Crew | Charlotte Crew shoots with the LT. Dan Band for Fox Files. Many of you know Gary Sinise as Lieutenant Dan, the gung-ho Army Lieutenant who loses both of his legs in the Classic film Forest Gump, but what you probably don’t know is that he plays bass guitar in a band named after Lieutenant Dan. 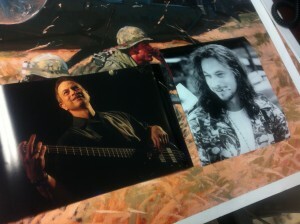 I recently had the opportunity to go on tour with Gary Sinise for a shoot with Fox Files. 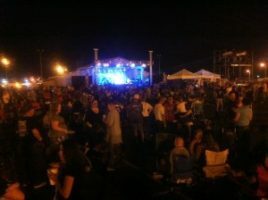 The Journey started at Fort Bragg NC, where we met with Sinise and shot the bands arrival. For the remainder of the day we followed Sinise and the band around basically capturing “day in the life” type of footage. Sinise is a huge supporter for our military and uses his bass playing abilities to help raise money for wounded soldiers across America. Later that afternoon it was time to head to the venue to set up for the show. I was shooting on the HDX-900 and needed to be mobile during the the concert so I was dependent on my wireless receiver to make that happen. We showed up at sound checkt to make sure we got the audio we would need from the sound board. Once sound check was done I was off shooting Broll for the concert and any cool things that were around the base. 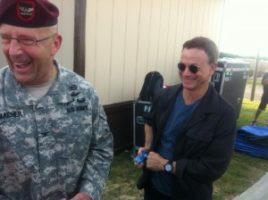 Sinise having a few laughs. Finally the band took the stage and it was time to roll. I was able to shoot from wherever I wanted so naturally I decided to be onstage for Sinise’s introduction. The LT. Dan Band put on one awesome performance as we jammed the night away to everything from Frank Sinatra to Katie Perry. These guys killed it! The fans could not have been better, they brought tons of energy for the show being in the middle of the week. It’s pretty amazing that Sinise dedicates his time and resources to help our wounded vets. He is a true patriot and I feel pretty lucky to have been apart of Sinise’s story. What a great guy and a great story. I live for cool shoots like this! Sinise and the crew drew quite a crowd at Fort Bragg. .